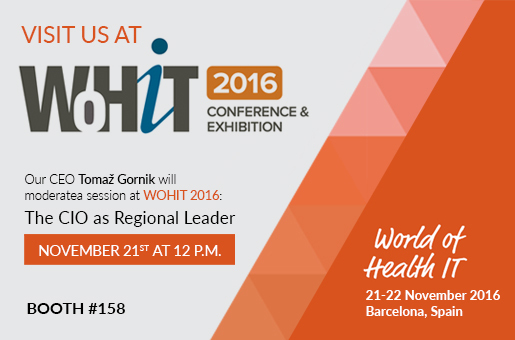 Tomaž Gornik, CEO of Better by Marand, will moderate a session entitled ”The CIO as Regional Leader” at WOHIT 2016 in Barcelona, November 21st at 12:00. The session will focus on the key role of CIO as “regional leader”, i.e., helping facilitate the development of an increasingly effective healthcare system in local areas. Speakers include Seamus MacSuibhne, Council of Clinical Information Officers, eHealth Ireland, and Jean Luchas Retamar Gentil, CIO, Servicio Andaluz de Salud, Spain. As a Gold Sponsor of the CIO Summit, Marand will also exhibit in booth 158 and present its Better Platform™: a vendor-neutral, open health data platform. With Better Platform™, our clients are capable of creating postmodern EHRs—modular clinical information systems which are open and agile, where they are free to introduce, renew or replace any apps they might require to support their clinical needs, while at the same time integrating all devices, and connecting patients and doctors in ways unobstructed by rigid and costly architectures of monolithic, closed EHR systems. We kindly invite you to visit us at booth number 158. Better by Marand’s vision for healthcare IT is coined as "Integrate. Open. Innovate." Better Platform™ is well aligned with this vision as it uses IHE-based standards to integrate existing devices, systems and data. By storing data in an open, vendor-neutral format it enables ecosystems of vendors to innovate. This approach is fuelling next generation solutions known as the Postmodern EHRs. Better Platform™ is a health data platform designed for real-time, transactional health data storage, query, retrieve and exchange based on vendor-neutral open data standards including IHE, openEHR and FHIR.